Gelati on a summer day in Melbourne, from Gelateria Primavera / Spring St Grocer. Gelateria Primavera, out the front of Spring St Grocer (157 Spring St, Melbourne) is one of my favourite gelati places in Melbourne. Their ever-changing seasonal menu is always a delight, with fresh ingredients skilfully handled to create pretty, sensuous flavours. I've been here several times and have tried a number of their offerings. There is the summery brightness of strawberry mint, the delicate elegance of peach basil, the tangy floral loveliness of yoghurt rose cardamom, and the surprisingly rich intensity of the no-dairy choc cashew. Sometimes there are more unusual creations, like rice pudding with lemon and bergamot, or prickly pear with pomegranate molasses, which I suspect don't come by often. Then there are the popular items which can often be seen on their board - the beautifully perfumed cardamom-pistachio is usually around, perhaps one time paired with turmeric, another time with saffron. But for all the fancy combinations, which I appreciate tremendously, my perennial favourite is the simple, yet absolutely luscious fior de latte (translation: "flower of milk"), which I could eat every time. This is an ambassador for the deliciousness of dairy, if there ever was one: pure, creamy perfection. And the cool thing is that, being a "basic" flavour, it's one that seems to be always on their menu. Just how I like it. Gelati on an autumn day in Melbourne, from Gelateria Primavera / Spring St Grocer. 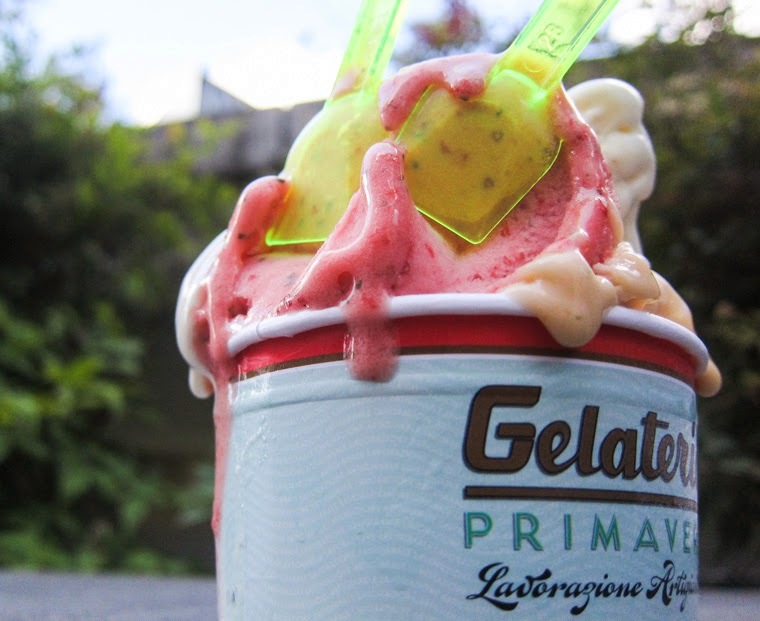 Also, despite their reputation and popularity, I like that I've yet to experience crazy queues or crowds with Gelateria Primavera, unlike some of the other trendy gelati establishments. Plus, they open till late everyday. What's not to love? I've popped in to the providore section of Spring St Grocer as well, and it's worth the time to browse their fresh produce or gourmet treats, which you may just decide to take home with you. 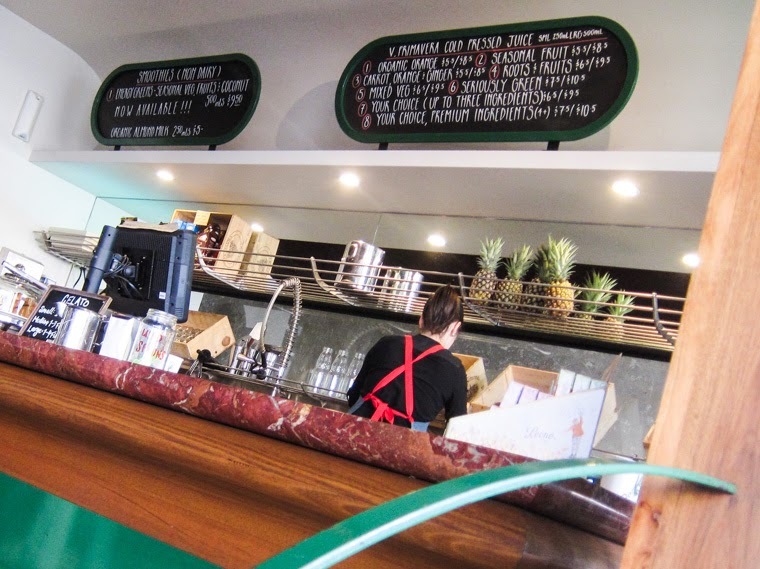 Additionally, my friends who work in the city tell me they like getting lunch at the "Rolls Ready" sandwich bar located inside. That's going to be my next stop, I think... and of course, I'll follow it up with their tasty gelati for dessert. Yum, love your description of the fior de latte gelati. It is so good. I love it. 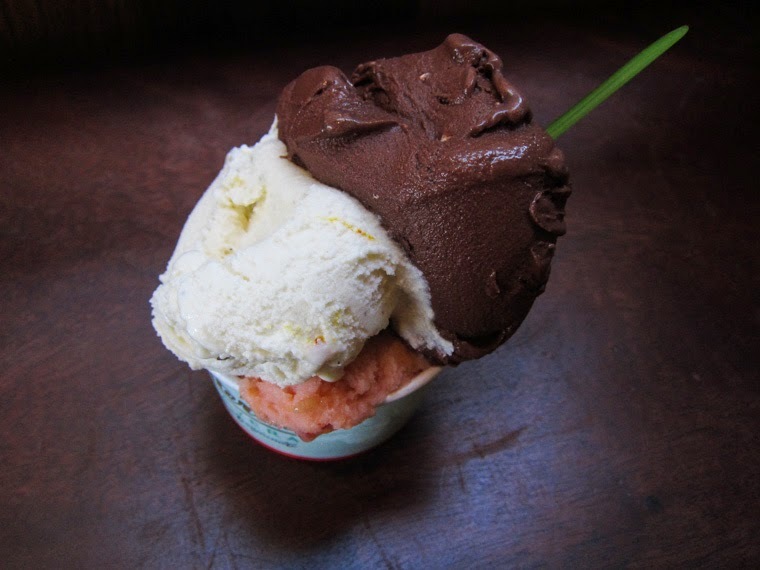 That choc-cashew gelati is very, very chocolatey! It's 10am and I really want gelato now! I was moving my head about in front of the screen to make the first image look like it was doing some in-motion dripping. Dammmnnnnnnnnn. We're going to get another snowstorm this weekend, summer where are yoooou.